Contaminates remaining in the sediment of the Miramichi River and its estuary are due to its land-use history. They may pose risks if disturbed. 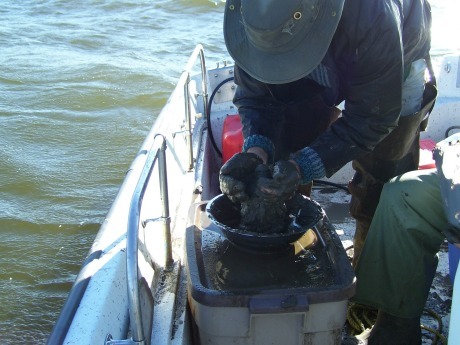 MREAC's analysis of sediment quality in 1993, 2002, 2005 and 2006 on the Napan Rivers and Upper Miramichi estuary, provide a partial picture of sediment quality. The upper estuary study (Parker 2006/07) is inconclusive but suggests that sediment quality may be improving. This could be due to upgrades in industrial process and improvements in municipal infrastructure, principally over the last decade. The other major factor appears to be the passage of time with reduced toxic inputs. Information gaps remained on the lower estuary of the Miramichi River. An updated assessment would be valuable for the benefit of economic and social sectors of our community to provide a basis upon which to make decisions of utilization, development or disturbance within the estuary. Recent downturns and closures of Miramichi based industries has resulted in reductions of inputs into the Miramichi estuary. improvements in forest management and wood harvesting policy"
Cadmium concentrations were higher in the sediment samples from the lower estuary and the Bay compared to the earlier results from the upriver surveys"
Copyright © 2018 Miramichi River Environmental Assessment Committee (MREAC). All Rights Reserved.